Agave spp. & Yucca spp. Few plants can match the bold and dramatic landscape impact of agave and yucca, both excellent choices for truly low maintenance gardening. ...hot sun, sandy soil, dry conditions, and salty spots.. In times past, both were used along the property border to deter trespassers. Their sharp points can stab, the spines on the foliage edges can tear, and their thick, wide, clustering growth can make the plants' armor hard to avoid. In today's lawsuit-happy environment, it's best to grow them in areas where no one (trespasser or friend) gets hurt. And, other than the spineless yucca (and a few soft-tipped agaves), these are generally not a good choice for yards with children or inquisitive pets. They can be dangerous to work around, too, so larger ones work best as a single specimen without a lot of frou-frou stuff interplanted under or very near it. Instead, combine with landscape boulders if the bed needs a finishing touch. Smaller varieties, however, can work well with other drought tolerant plants, creating a very low maintenance landscape. 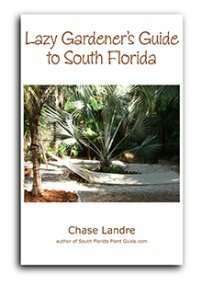 They're all salt tolerant and do well in beachside plantings. The most well-known fact about agave is that it's used to make tequila. The most commonly used of these plants is one called the Century Plant (A. americana), a dusty-gray beauty which grows to 5 or 6 feet (and is considered deer-resistant). But there are many others to choose from, some very large and others quite small. Foliage color can be dark green, yellowish-green, blue-green or gray-green. It can be a solid color or combinations with yellow, cream, or white. Eventually this plant will send up a flower...this can take quite a few years, though not 100 as the name century plant implies. 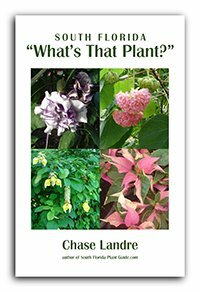 The flower stalk can grow very tall, and blooms may be yellow, red or white. When in bloom, the flower stalks can branch out to look like bonsai trees. Once it flowers, the plant begins to die and the offshoots or "pups" (baby shoots) fill in. Although these plants have been used as a food source, the sap and thorns contain certain toxins that can cause skin irritations. Wear gloves when handling - and ALWAYS wear safety glasses or sunglasses when working around the pointy ends of this plant. 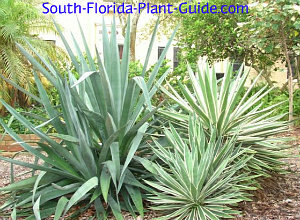 Yucca differs from agave in that it has thinner leaves and usually forms a trunk. The exception is a trunkless variety known as "Adam's Needle" (Yucca filamentosa) which stays low to the ground, growing only about 3 feet tall. There are several varieties to choose from...including the classic "Spanish Bayonet" and spineless, more people-friendly varieties. The white yucca flowers are huge and gorgeous and appear on mature plants during warm months. The bloom indicates this particular stalk will die, and other offshoots will fill in. Full sun is ideal, though some will also grow in partial shade. A well-drained planting location is a must. Flowering usually takes place during spring or summer. Growth rate and size can vary...ask at the nursery when you buy a plant what to expect from the variety you're interested in. 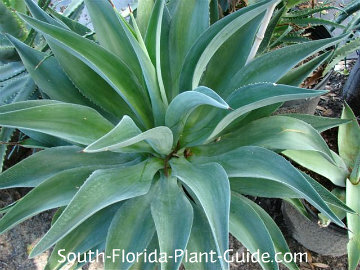 Surprisingly, some agaves have a moderate or even fast growth rate. Zone 10 is best for most agave varieties, though some are hardier than others. Cold and frost damage will greatly detract from this plant's good looks, so in Zone 9B you may want to grow it in a container to be moved indoors during cold weather. 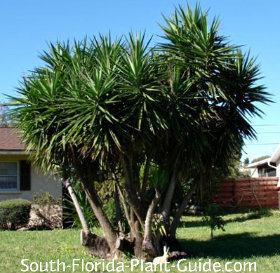 Yucca, on the other hand, can take more cold and will do fine anywhere in South Florida. It's a slow grower and, as it ages, sends up new trunks in clump formation. Some may reach out and swoop away from the center - they can be removed to keep the overall effect well-shaped. Both plants are salt tolerant and work well in coastal plantings. No soil amendments are necessary for these tough plants. 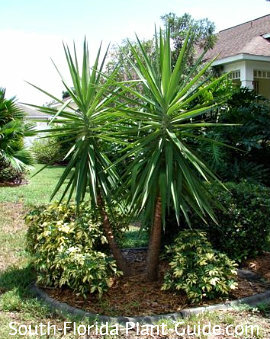 Trimming is rarely needed other than to remove dying leaves from a yucca. Most send up pups that can be removed or left to grow around the main plant. This can be a time-consuming chore with some varieties. Both these plants are very drought tolerant, though a regular watering is beneficial as long as you give the soil plenty of time to dry out between waterings. If nothing else, at least water to get the plant established, and then during dry spells to promote the best of health and beauty. Fertilizer is also optional. However, the plants will benefit from being fertilized 3 times a year - in spring, summer, and autumn - with a top quality granular fertilizer. 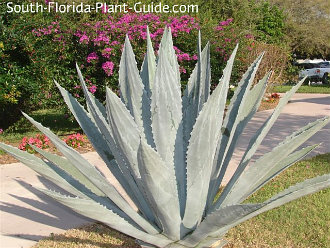 Depending on the ultimate height and width of an agave, place it with plenty of room to walk by it safely - a minimum of 2-1/2 feet for smaller varieties, and up to 6 feet or more for larger ones. Yuccas grow up fairly straight, and can be situated 5 feet (or more) from walks and drives. Eventually, wayward shoots may have to be removed to allow for foot or vehicle traffic. Both make excellent container plants as long as the pot has good drainage. 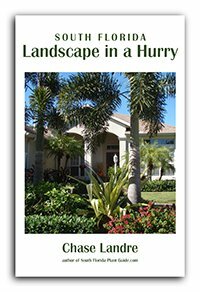 COMPANION PLANT SUGGESTIONS: Nearby drought-tolerant plants might include ice plant, crown of thorns, muhly grass, Green Island ficus, frangipani, and desert rose.